Hydropower cooperation is set to scale new heights with a new power plant that can satisfy energy needs of India's northern region. “India captures your soul,” exclaimed Alexander Fink, director for international cooperation of the Russian Research Institute, Hydroproject. Late last year, Hydroproject signed a pact with KSK Energy Ventures Limited K.A., under which Russian engineers will develop a technical design for the Upper Subansiri hydro power plant on the Subansiri river in India. The new power plant will boast a 230-metre high concrete dam. With 2,000 MW capacity, it could supply power to India’s entire northeast and satiate the demand for cheap energy in West Bengal and other industrial areas in Northern India. Hydroproject plans to complete paper work on the project in November this year. “We have sent two geologists there, and should complete exploration and engineering studies before the monsoon season strikes. By the end of this year, we must submit a technical design for the plant to the customer,” Fink said. Hydroproject, part of the RusHydro holding company, is one of Russia’s oldest engineering institutes specialising in the development and design of hydraulic engineering facilities. Hydroproject has a successful track record of working in India. 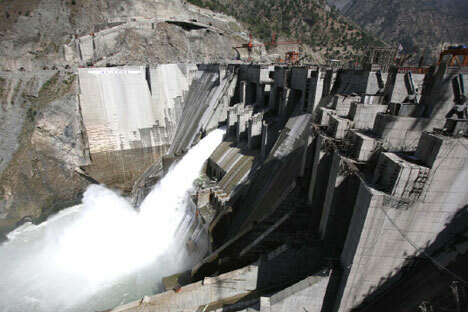 In 2006, the Russians assisted India in building its largest hydropower complex, the Tehri, in the state of Uttarakhand located in the highly seismic Himalayas. The 260-metre high rock and earth-fill embankment dam houses a first-stage, 1,000 MW underground power plant. Four more units at 100 MW each are scheduled for launch later this year, with eventual total capacity planned at 2,400 MW. The new hydropower complex’s successful operation came as a surprise to many as the area is prone to earthquakes. Engineers from Hydroproject used advanced design software that has already kept the power plant up and running successfully for five years now. The Upper Subansiri project is no less complicated. “Subansiri is a very full-flowing river, a major tributary of the Brahmaputra. And this is the first large hydropower complex to be built on this river,” said Fink. The complex should come online in 2016. A concrete dam will cut across the river, and a 2,000 MW underground power plant will generate electricity. The Russian engineers advised the client to abandon the underground design in favour of a surface-located plant. Besides, Hydroproject is participating in creating a unique hydropower complex in neighbouring Bhutan. Called the Sankosh River hydropower complex, Hydroproject has already completed an investment feasibility study. A 285-metre high dam, to be built there, will be one of the world’s five tallest. The complex will have a 4,000 MW capacity, which will be transmitted into India’s heartland across West Bengal. Russia is also helping India establish its own complex hydropower project monitoring service. “Facilities start falling ill right after birth, just like babies. That’s why monitoring them is essential,” said Fink. India has asked Hydroproject to train their specialists, who have already completed courses taught by Russian instructors. The RusHydro development model provides for entering international markets. Our main focus is clearly on hydropower and we are entering regions that have abundant water resources, are experiencing high demand and have a favourable investment climate. We have drawn up our roadmap: Southeast Asia and India, Latin America and Africa and Turkey. The most interesting thing is that we can develop various cooperation models. We can act as the main construction contractor together with Tekhnopromexport, for instance. We can bid for equipment installation and engineering work, an area where the experience and expertise of our design and engineering teams can be useful. We can discuss equity investment. We can also limit our discussions to just management and energy transmission. We have a number of diverse scenarios to offer our partners. This gives us an advantage. We are considering interesting options in India. The main thing is that we are not only looking at building just hydropower plants, but also water-storage, tidal and wave energy stations. India is a place where we are likely to work on completely new projects. It’s is a huge country with a growing potential, growing demand and has its own specific character. But it is also a country abundant in water resources. We should definitely go to India and work with our Indian colleagues.